Amazing Lakefront and mountain view home in Covington (Kent)! You cannot get a better Pacific Northwest experience than staying at this home on Lake Morton. With stunning views of Mount Rainier, colorful evergreen trees reflected against the calm waters of the lake and peaceful sounds of birds in the trees, it truly is an iconic Washington state experience. Giant picture windows throughout the main floor of the home offer views of Mount Rainier (weather permitting) and the lake from the kitchen, dining room, living room and master bedroom. Sliding doors open to the back deck, where you can relax in the oversized hot tub, grill on a gas BBQ (or for the more adventurous bring charcoal and use the charcoal grill provided down at the lake front), eat and relax in the covered outdoor dining area, all the while enjoying the ever changing scenery this home is fortunate enough to provide. From the bottom floor of the house, multiple sliding doors take you to a private, fenced in back yard leading down to the lake through a beautifully landscaped, two tiered yard. The back yard offers a quaint walkway which takes you directly to the lake passing by a koi pond hiding in the garden (feel free to toss in a handful of food provided in the pantry), plenty of grass to play in, and a shed containing a selection of water toys for your enjoyment. There is a paddle board, kayaks, row boat, and if you want more toys, Fred Meyer and Costco are just 10 minutes away. Enjoy fishing on the Lake (proper license necessary) for trout and bass. Close proximity to several local wedding venues including: Brookside at Covington, Villa Rose Gardens, The Sanders Estate, Wine and Roses Country Estate, Crones Place, Rein Fire Ranch plus multiple other venues in nearby areas (Auburn, Maple Valley, Kent, Black Diamond, Ravensdale, Enumclaw). 1) Friends or Couples Retreat – with a hot tub, BBQ, spacious and beautiful indoor and outdoor dining areas, this home is perfect for a fun and relaxing adult getaway. 2) Family Vacation and/or Holiday treat – with 4 bedrooms, a large TV/Rec room, huge backyard and private dock access, this home is the perfect destination for a family vacation. There are no motor boats allowed on the lake, making it kid and swimmer friendly. Children and adults alike will love floating in the middle of the lake, or jumping off the diving board (depending upon the level of the lake). With a large, flat screen TV complete with cable and DVD player, there are plenty of entertainment options for when the sun goes down. You will find a variety of games available as well which provide wonderful memories you will cherish for years to come. 3) Small Group Vacation – Bring your friends, family, and extended family to Lake Morton for a quiet weekend away or activity packed celebration. While the lake itself offers plenty of fun, Lake Morton is within an hour’s driving distance to many iconic Pacific Northwest hiking trails, mountain biking, road cycling, ski / snowboard mountain, Chinook Pass, White Pass, Mt Rainier National Park. Also within driving distance are movie cinemas, outlet malls, golf courses , Pacific Raceways, Black Diamond Tough Mudder, and so much more. The area offers some of the best of the Pacific Northwest with enough fun and activities to suit a wide variety of interests. You won’t need to come too prepared for your stay at Lake Morton, as there is a Costco, Fred Meyer, Safeway, Walmart, gas stations, pharmacies, and many restaurants just 10 minutes away. ** SPECIAL NOTE: HOME IS A 7 NIGHT MINIMUM STAY SATURDAY-SATURDAY! Hello! My name is Denise. I am an East Coast native who moved West with her family at the age of 9. Since then I have lived in the Western Washington Area, currently residing in a condo a little north of Seattle. I am the proud mother of 2 daughters; one who is finishing her schooling at Western Washington University and the eldest living in New York City. I am an avid cyclist, skier, and have a new found love for water skiing (or should I say, I attempt to water I can stay up!). I grew up in the home next door. Lake Morton is a special part of my childhood as well as my children's childhood. I have spent summers, winters and holidays here with family, friends and neighbors, and absolutely love this lake. I am thrilled to be able to share my a part of my "soul" with others..
Lake Morton is a great place for the whole family to relax and enjoy. Motor boats are prohibited on the lake, making it a great place for worry-free swimming, paddle boarding, and quietly enjoying the view. Nearby Lake Sawyer and Lake Meridian do allow motor boats and related sports both with public boat launches. You can easily spend the day with these boating activities and then come "home" (about 15 minutes away) and enjoy peace and quite. 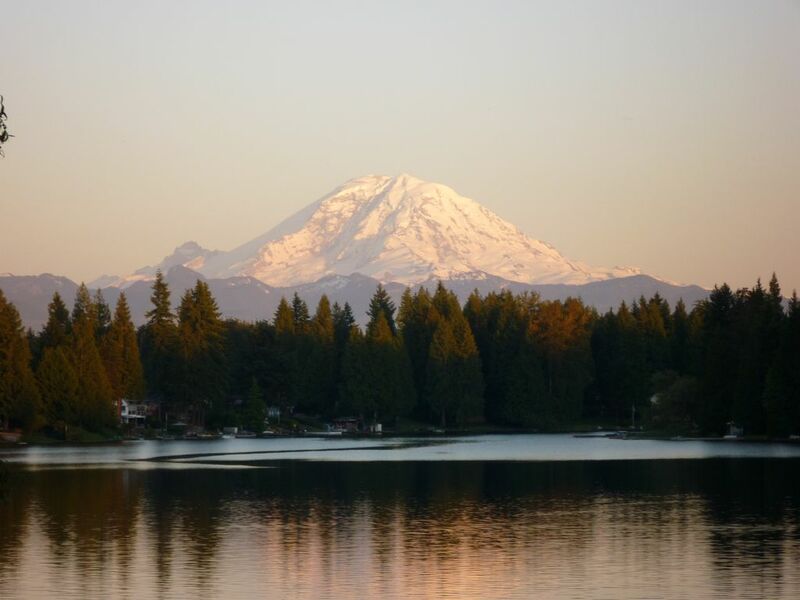 The property itself has one of the best views of Mount Rainier on the whole lake. Enjoy stunning sunrises and sunsets, marvel at the beautiful Pacific Northwest colors of evergreen trees, purple skies and snow capped mountains. From sunrise to sunset regardless of the weather, you will feel the peace and joy you are surrounded by, possibly sprinkled with sighs of enjoyment from yourself and fellow travelers. You only need to look out your back window and walk out your back door, down a short path and you are at your own lakefront private beach. Look at the pictures taken from the deck. Guests to provide laundry detergent. Gas fireplace in living room, great for relaxing by the fire and looking at the lake (currently out of order). Addition mini freezer on back deck allows you to make that trip to Costco and then relax. Good size gourmet kitchen featuring quartz counters, peninsula and large sink overlooking the yard and lake. All new Kitchen appliances. Gas stove, oven, bbq. lake kayaks and paddle board. Some life jackets provided. Please practice safety at all times. If there in not a life jacket that fits, Fred Meyer is nearby. Druids Glen is closest but many, many nearby. Guests to provide laundry soap, dishwasher soap, and additional paper products. "starters" are provided for all but owner cannot determine and provide for all users needs. This is our 3rd year renting this lake front home. The lake is fantastic for swimming and water play with the kayaks and paddle board. The house had plenty of space for our 3 generations to gather, sleep, eat, and we loved the huge deck, views of Mt. Rainier, and hot tub. Some spaces are needing a bit of maintenance but Denise was available for questions and help. As described, it isn't a 5 star resort, but it is a wonderful place for a homey summer vacation! The view from the second floor deck of Mount Rainier and the lake was priceless. Because of the good weather we spent much time on the deck taking in the beautiful views. The hot tub on the deck was a nice place to relax and take in the view as the sun set and Mount Rainier turned pink, then blue. The property was lush with plants, flowers and trees with a pair of humming birds that made many visits to the flowers. The home was well appointed with a nice kitchen with all of the essentials to cook any type of meal. There was a gas grill we used twice. We spent time on the lake in the kayaks but there were not enough for all four of us so we would trade off. My one suggestion would be to add a couple more standard kayaks for more people to go out on the lake together. The owner did help us out to burrow a couple of kayaks later in our stay which was really appreciated. I would come back and will let friends know what a great time we all had there. Loved this house! It was homey and comfortable and a great place to unwind with friends. The view form the deck was fantastic - even when the mountain was covered with clouds. Well equipped with everything you could need to make yourself at home, and lots of space for larger parties to spread out and find some privacy. Denise was helpful and accommodating, considering we had some special circumstances. Would highly recommend this vacation home - especially for those who love outdoor recreation and peaceful views. Thanks Denise for everything! It was my pleasure to share my "piece of paradise" with such a lovely group of friends and family, from near a afar. I would highly recommend Lori Hill to other owners. My home was left very clean and Lori was wonderful to work with. One of our high school girlfriend's daughter got married. All of our high school friends along with husbands came to celebrate the occasion. The house accommodated us well. We were able to see the spectacular site of the mountain upon arrival. The lake was so calm throughout our stay. We cooked, played games and visited. The house worked out well with space to roam freely inside and out. Denise was very friendly and good to work with. Thank you for sharing your home. Perfect escape from the city. My friends and I rented this home for the weekend. The photos and description are pretty spot on. Interior is adorable. Amazing view. Great porch with hot tub on a perfectly calm lake. I brought my paddle boards and we pretty much had the lake to ourselves. Owner also had 3 kayaks, standup paddle board and something else. There is a private dock with a nice yard and lounge chairs. A quaint little bench on the dock is nice in the AM with coffee. The kitchen was stocked with tons of stuff. Fridge had way too many condiments in it though. They had a nice big pantry and a small freezer outside. Would be awesome if an extra fridge was put in carport. 😄 The place was pretty clean upon arrival too. Most airbnb units are not cleaned to my standards and I have to clean myself. I didn't with this one and that was a nice treat! Bed in master was super cozy!! Thank you Denise for being such a great host! We might be back next summer for another girls weekend!! Our family thoroughly enjoyed the time we spent on Lake Morton. Mental health has been restored all the way around!! It was a perfect fit for us as my 89 year old Mom could sit on the deck with a glass of wine while enjoying the AWESOME view of Mount Rainier and the rest of us frolicking around!! In the meantime my wife and I, our 32 year old son and our 8 year old daughter were swimming, kayaking, fishing and living it up!! It got VERY HOT by the end of the week but the lake more than took care of that!! Magic for sure. My little girl caught 6 fish (first time) I thought she was going to bust she was so thrilled. She took to kayaking like a duck and paddled all the way around the lake with Mom early mornings, while with me we went out to the center of the lake when the moon was rising and were surrounded by clouds and clouds of bats!! No wonder there were no mosquito's!! Watched Osprey's fishing and making hits too!! Trying to get a peek at the resident bullfrog (we heard him!!) while feeding the Koi was fun too. Neighbors VERY friendly, lots of playmates for our daughter. Absolute Magic. Thank you Denise for sharing your wonderful home!! We hope to return one day!! This home is located within 45 minutes to an hour from Downtown Seattle as well as Downtown Tacoma. Multiple museums (museum of flight, Chihuly, Seattle Art Museum, etc) Pike Place Market, live theatre, and so much more. After a day spent in the hustle bustle of the downtown come home to your private lake front and BBQ crab, salmon, oysters, etc. you may have picked up on you journeys. Not interested in going into the city but want great food to bring home and cook? There are number of wonderful butcher shops and seafood outlets in the area, as well as incredible bakeries (Black Diamond Bakery), and wine shops.